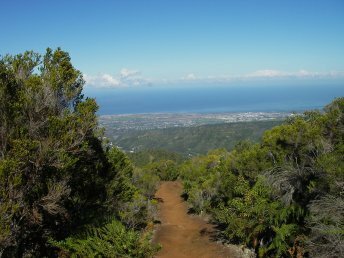 A pleasant loop along woody trails and ridges, amidst magnificent landscapes: the uplands of Entre-Deux, the Tampon planèze, the Indian Ocean, the Cirque of Cilaos et the highest summits of the island. We rapidly reach the Dimitile summit on a steep footpath (circa 2h30), offering a superb view for the Cirque of Cilaos. We descend along a charming forest path with a few streams crossings.